Home Tags Posts tagged with "george bush death"
World figures and all surviving US presidents have paid their respects to former President George H.W. Bush, during a state funeral in Washington. 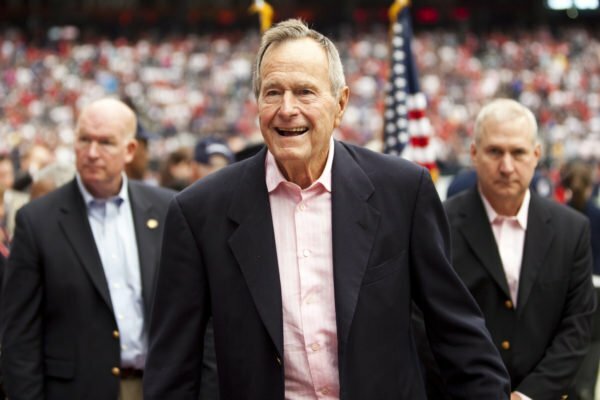 Former President George W. Bush described his father as “a noble man, the best father”. George Bush Sr., who served as the 41st US president between 1989 and 1993, died on November 30 at the age of 94. In his eulogy, George Bush Jr. said his father had taught him that “public service is noble and necessary”. The Prince of Wales, former UK’s PM John Major, German Chancellor Angela Merkel and Jordan’s King Abdullah II were among the world figures there to pay their respects. December 5 has been declared a national day of mourning – many government offices and US stock exchanges are closed. Following the funeral service, George H.W. Bush’s flag-draped casket was carried from the cathedral by a military honor guard and was later flown to Texas, arriving in Houston at 23:00 GMT. The casket will lie in public repose at St Martin’s Episcopal Church until December 6. There will be a second service before the Bush 4141 – a train which was named in honor of the president – takes his body to its final resting place, next to his wife Barbara at the George HW Bush presidential library. Jim McGrath, who was George H.W. Bush’s spokesman, said the president had once wondered if anyone would attend his funeral. George H.W. Bush was a decorated fighter pilot in World War Two, a head of the CIA and vice-president to Ronald Reagan before being elected president in 1988. George H.W. Bush has been described as a bipartisan figure who tried to make conservatism “kinder and gentler”.